The records held by Annie MacPherson and the Liverpool Sheltering Home were given to the Barnardo organization for safekeeping. Annie MacPherson was born in 1833 in Stirlingshire, Scotland, to a father who was a teacher and a member of the Society of Friends (Quakers), Annie MacPherson was the eldest of seven children. Early on her father, James MacPherson was commissioned to establish schools on Lady Lovelace’s estate. In addition to her own children, her mother, Mrs. MacPherson, took care of two orphaned children. After the death of her father, Miss MacPherson, her mother and the youngest members of the family moved to Cambridgeshire to be near her sister Rachel, whose husband ran a prosperous farm. Rachel and her husband had four sons. It was at this time she taught Sunday School and Bible Class. The idea to help poor children came after a revival meeting held in London where she met Lady Rowley. Following her father’s earlier lead, Miss MacPherson used skills she had learned from her father and the education she had gleaned from the Home and Colonial Training College in London to start up a mission that included clubs, coffee-rooms and classes. In 1865, Miss MacPherson moved to London with her mother to teach at the Bedford Institute, run by the Society of Friends. In 1866, she visited the United States with her sister and brother-on-law when they moved there. Upon her return, she immersed herself in charitable work after being taken to see the horrors of the East End of London by Lady Rowley, the worst of which were the child matchbox makers – children who spent all day every day of their lives making hundreds of boxes every day. Miss MacPherson began night classes for those children enticing them to come by offering a meal. Supported by the subscribers of the publication The Revival. Supported by these funds, she was able to open a Home for Boys under ten. This was followed by a Home for Girls. 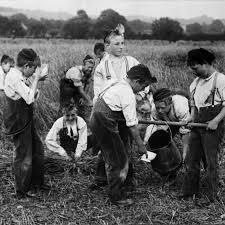 A third was opened for boys between 10 and 13, where they could learn to read and write. They also learned trades. As a fourth, even larger Home, the Home of Industry, was opened, Miss MacPherson realized it would never be enough. It was then that the way of emigration to Ontario, Canada opened and in April, 1869, 50 families (500 people) went to Canada, clothed and paid for, through the MacPherson organization. In 1870, Annie MacPherson herself accompanied 106 children from London, accompanied by Ellen Bilbrough and Leslie Thom. 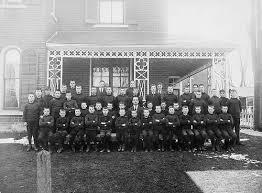 Upon arrival in Quebec City, eleven children were indentured there, four went to Richmond Quebec, 23 were placed in Montreal, 20 in Ottawa and eight in Belleville, Ontario and the rest were placed in Toronto and Hamilton. In July 1870, Mr. Merry, Miss MacPherson’s brother-in-law travelled with 70 boys and her youngest sister, Louisa Birt travelled with her sister and the third group of children to a new Receiving Home in Belleville, known as Marchmont Homes. It was run by Ellen Bilbrough. Unfortunately a fire destroyed Marchmont in 1872 and a five-year-old boy lost his life. Belleville residents helped build a new location for Marchmont was found. A Senator from Belleville realized, thought, it was not large enough and helped fund-raise to provide the third, larger Marchmont Home. In 1872, two more Homes were erected: one in Knowlton, Quebec and one in Galt, Ontario (now called Cambridge), Children from the Orphan Homes of Scotland (now known as Quarrier’s) began using these Receiving Homes. Blair Atholl, in Galt, was situated on a 100-acre farm and was used to teach urban Londoners Canadian farming practices. In 1877, the ailing Miss MacPherson, offered her sister Louis Birt, the Knowlton Homes to bring her charges from the Liverpool Sheltering Home and Marchmont was turned over to Ellen Billbrough to be used by many agencies originating in Scotland and by a group from Manchester. 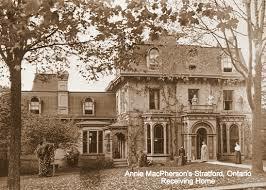 Miss MacPherson continued to travel to Canada and in 1882, the farm in Galt was sold and a house was purchased at 51 Avon Street in Stratford, Ontario. At this point, the operations were taken over by the sons of Miss MacPherson’s sister – the Merry family. In 1887, James Merry left to supervise, 2,000 acres of land in Barnsby, Manitoba that had been donated. It was to be subdivided and sold to former Boys. The plan failed due to economic upheaval. Contracting double pneumonia in 1902, Miss MacPherson never became well again. She died in November, 1904. Despite this her work continued in the Stratford area under her nephew, William Merry. In 1915, the work was merged with the Liverpool Sheltering Home and Knowlton Homes were closed. 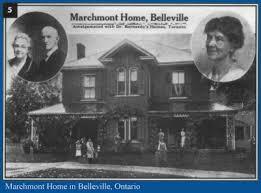 In 1920, Stratford closed and Marchmont in Belleville was used once again.